Provides three 3 prong outlets and extends your existing cable. Connect your computers, peripherals and other office equipment. 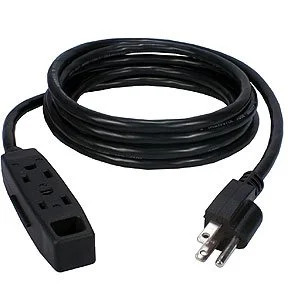 Multi-outlet extension cords are used to power multiple tools and devices at one go. We have a range of multi-outlet extension cords available at SF Cable. In this category we have products like 3-outlet 2 prong power extension cords, 3 outlet 3 prong power extension cords, and many others. You can find these cords in various lengths as well. All our products are RoHS compliant and environment friendly. We source all the goods directly from the manufacturer, hence eliminating the cost of middle parties and allowing us to keep the costs competitive. We work with dedication to achieve customer satisfaction and provide lifetime technical support for our sales.